MDN Inc. (“MDN”) (TSX:MDN) is pleased to provide a progress report on drilling at its goldIkungu property in Tanzania, as well as an assessment of the mineral potential of this 3-km long gold-bearing structure. Drilling to test gold soil anomalies in the extensions at both ends of the mineralized zone began on January 20, 2011. Because of logistical difficulties encountered by the contractor, only one drill, an RC drill, was mobilized instead of two. The second drill, a diamond drill, arrived on site at the end of March, and is now drilling the western sector, an unexplored 1-km-wide area between sections IKD-33 and IKBH-42. In the western area, drilling on sections 970E and 1195E is complete, and assay results show that Section 970E cuts through the mineralized structure, with an intersection of 2.87 g/t Au over 2 metres in Hole IKBH-48 (true thickness unknown). 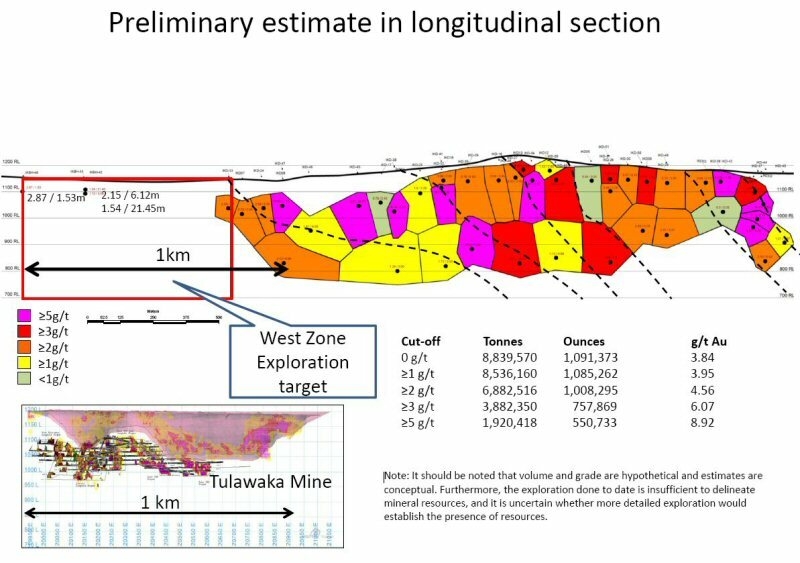 Combined with the earlier results of Hole IKBH-42 on Section 1195E, this means that the mineralized zone has now been traced by drilling over an additional kilometre to the west (see attached longitudinal). To the east, drilling intersected rocks that are favourable to mineralization 770 metres farther east than the last intersection in IKD-43 (1.21 g/t Au over 3.73 m, true thickness). Assays are pending. The 2010 results have identified a mineralized zone more than 3 km long, including a 2-km section with enough information to assess the mineralized material. Based on 42 holes and surface mapping, MDN has outlined and modeled a continuous, conceptual mineralized zone. The intersections indicate that the zone is continuous and has good grade and volume potential. Thirty of the 42 holes, or 71%, intersected more than 2 g/t Au over a 2 m horizontal width (1.88 m true thickness). A preliminary assessment also allows optimal planning of future drilling aimed at outlining a gold resource on the 2-km section. The volume of the model was quantified using two block methods: cross-section and longitudinal section. The conceptual scenarios indicate that, at a cut-off grade of 3 g/t Au, the mineralized zone would contain 1.9 to 3.8 million tonnes grading between 6.07 and 8.92 g/t Au, equivalent to 550,000 to 757,000 ounces of gold. “We are extremely pleased with the preliminary assessment on this gold property, which was discovered by MDN’s exploration team and points to a promising future for us in Tanzania,” stated Serge Bureau, President and Chief Executive Officer of MDN. The mineralized zone is made up of intervals averaging 2 to 15 m horizontal width (1.88 m to 14.1 m true thickness) with grades of 1.21 to 24.5 g/t Au. Drilling has outlined a zone 2.0-km long, extending to a vertical depth of 325 m. The geological model developed by MDN shows a zone striking 110°and dipping southward at a constant 70°. It should be noted that volume and grade are hypothetical and estimates are conceptual. Furthermore, the exploration done to date is insufficient to delineate mineral resources, and it is uncertain whether more detailed exploration would establish the presence of resources. Based on the consistency of intersections in the mineralized zone and the results obtained one kilometre farther west, MDN believes that the gold mineralization extends laterally and at depth outside the assessment area, in the direction of the strike and dip. MDN Inc. (TSX:MDN) is a mining exploration and development company exploring and developing projects in Quebec and Tanzania. The Company is also active in the search for new business opportunities that can increase shareholder value. In addition to its 30% interest in the Tulawaka gold mine, MDN is the operator and owner of a majority interest in mineral licenses totalling 757 km2 in the vicinity of the Tulawaka mine. MDN also has a 72.5% interest in Crevier Minerals Inc., which owns an NI 43-101 niobium-tantalum resource in the Lac-Saint-Jean area of Quebec. MDN has an option to increase its equity participation in Crevier Minerals Inc. to a maximum of 87.5%. Additional information is available on MDN’s website atwww.niobaymetals.com.